Only last year, it seemed that New Hampshire officials were ready to welcome expansion of Kinder Morgan’s Northeast Energy Direct pipeline, which would skirt through 78 miles of southern New Hampshire, mainly on existing utility right-of-ways. After all, it has the capacity to deliver 1.3 billion cubic feet a day (bcf/d) of natural gas to an energy-starved region, where memories are still strong of the winter of 2013-14, when a severe winter caused energy price spikes, and with coal and nuclear power generating plants closing around the region. But now that the Houston-based energy conglomerate has filed a federal application for the $5.2 billion, 188-mile project, it is facing opposition from officials ranging from boards of selectmen to the State House, from much of the state’s congressional delegation, and even presidential candidates. In fact, in the last few months, everything seemed to have conspired against the company. Even its stock price has been plummeting, as gas revenue and profits decline after growing steadily over the last five years. Its bond rating has been downgraded because its debt level – at close to $40 billion – is nearly 50 percent of the company’s assets. The debate now isn’t so much over whether the NED pipeline is safe or environmentally sound, but if it is needed at all, and whether spending $5.2 billion to build it would be an economic boon or a bane. From Kinder Morgan’s perspective, as well as proponents’, the pipeline is a relatively simple fix for a tantalizing problem: New Hampshire faces relatively high energy prices, both for natural gas and electricity (which is now mainly generated by natural gas plants), despite being so close to cheap supply – the Marcellus Shale fields in Pennsylvania and New York. That is because fracking technology, which wasn’t even employed 20 years ago, caught everyone by surprise, including Kinder Morgan, which for several generations had used its existing pipeline network to deliver gas in its liquefied form from eastern ports to the Midwest. “We’ve got sources of gas coming into our pipe where there used to be markets and we have markets where there used to sources of gas,” Kimberly Watson, president of Kinder Morgan’s East Region Gas Pipelines, told NH Business Review in November, about two weeks before the company’s pre-Thanksgiving application to the Federal Energy Regulatory Commission. “It makes all the sense in the world to source your gas as you can,” she said. “And this is such an abundant and inexpensive supply of gas, and it just makes sense to access it,” she said of the Marcellus Shale fields. 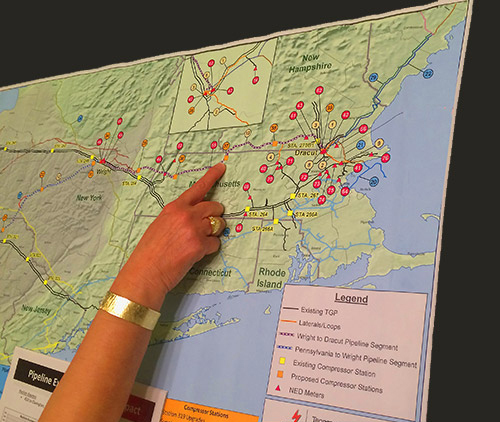 At first, the pipeline would have mainly avoided the Granite State, but after facing stiff opposition in Massachusetts, the company made its New Hampshire alternative the main plan. The new 188-mile route is “co-located” through, or usually to the side of, existing utility corridors, except for 17 miles of “bits and pieces” that left that pathway for environmental reasons, Watson said. The company also downsized the size of the pipe’s diameter from 36 to 30 inches and the total amount of gas to be transmitted from 2.2 bcf/d to 1.3 bcf/d. But the company so far has faced the same kind of protests in southern New Hampshire as it has in Massachusetts, and that opposition seems to have percolated up the state’s political hierarchy. Many towns voiced opposition to against the pipeline before the company had officially filed its application. At the local level, concerns about leaks, explosions, environmental disturbance and eminent domain were at the forefront. On its website, Kinder Morgan touts the 1,000 temporary jobs pipeline construction would create and the $16.8 million in property taxes the company would pay, gaining the support of construction unions, if not the general public. When it comes to regulatory battles, it’s the economic and not the environmental issues that have predominated. For FERC to grant powers of eminent domain, Kinder Morgan has to show that NED is in the public interest. (It is expected to make similar arguments when it files with the state Site Evaluation Commission in the coming months). And much of the company’s FERC application centers on how it will ensure that pilot and electric lights stay on, how it will save ratepayers money, and how much carbon pollution will be avoided. The pipeline would lower regional natural gas prices by 65 percent – both by lowering prices and offering gas over a larger area to an alternative to the higher priced oil – and it would lower electric lower electric costs in New England by $1.2 billion a year, the company said in its FERC filing. For New Hampshire, Watson said in a recent statement, the pipeline would save those switching from oil to gas 40 percent on their heating bills, and ratepayers would save $437 a year on electricity. This has gotten the ear, if not the outright support, of business groups, including the Business and Industry Association of NH, which has made controlling energy costs one of its top priorities. But pipeline opponents question whether ratepayers will be saving anything at all, particularly when it comes to electricity. That’s because, so far, none of the new gas that would be coming in through the pipeline is slated to go to all those gas-fired power plants. The Northeast Energy Direct pipeline has two parts. It would increase the supply path (the producers selling the gas) to 1.2 bcf/d and the market path (those buying the gas, like gas utilities and power plants) to 1.3 bcf/d. With 0.75 bcf/d already contracted for, the supply part is more than half sold. On the market, or consumer side, 0.55 bcf/d has been reserved. Thus far, only the natural gas utilities (Liberty Utilities in New Hampshire) have committed to buying the gas. No power plant has yet signed on. Two “open seasons” – the latter, specifically aimed at power plants, ended in October – have not resulted in more commitments, though Kinder Morgan said that there was “interest” in 1.0 bcf/d, and it was “confident” that it will eventually work out a deal. The difficulty is that power plants currently have little incentive to take out long-term contracts. But without long-term contracts, power plants may be forced to pay through the nose when prices spike during harsh winters. But that’s only a few weeks out of the year. Most of the time, the power plants pay less for gas on the open market, which is why they would do it. There was an attempt by New England’s governors to levy a regional tariff on electric ratepayers that fell apart, and now there is an effort to do this state by state. The NH Public Utilities Commission staff recommended moving in that direction, a recommendation that Kinder Morgan cited approvingly as a sign that the “conversation,” as Watson calls it, is continuing. But opponents have criticized the PUC staff, saying that it was uncritically using data supplied by the industry. It would be cheaper, they say, to convert plants to use dual fuels, and either use liquefied natural gas or oil, both of which have significantly dropped in price in the last year. That’s what happened last winter, which was just as cold as the previous one, without the huge price spikes, opponents have argued. That’s what the Massachusetts attorney general says as well. In a study released in November, it stated that New Hampshire has enough fuel on hand for electric generation except for a few hours on about nine very cold days until 2029-30. All that would be needed on those cold days is another 0.42 bcf/d. If Kinder Morgan doesn’t succeed in getting long-term commitments from power plants, it will still build the pipe to the same size, but it will adjust the compression equipment, said Watson. In its application, Kinder Morgan said it would eat the excess cost if it couldn’t sell the gas. But even without long-term contracts, Watson argued, increasing the capacity gives the company more flexibility to supply gas to power plants, and that will result in lower prices. Maloney contended there is already more capacity on the existing pipeline that isn’t being used because it isn’t contracted for. If the extra gas is already taken by the gas utilities, he said, the rest would be sold on the spot market, or shipped overseas as liquefied natural gas, once the capacity is in place at the ports to export as well as import. Kinder Morgan said it has no plans to sell its gas overseas, but by law can’t turn away any buyers for its gas. “The big picture, is that this is a heat load project, not an electric project,” Maloney said. But what about it as a heat load project? Here the benefits are a bit clearer. Liberty Utilities, as noted in the FERC application, has applied for natural gas franchises in the towns of Jaffrey, Rindge, Swanzey and Winchester, with plans to service Keene – all dependent on the NED pipeline. That would allow residents and businesses in those towns to switch from oil to gas for heat. In addition, a greater supply of natural gas might encourage others around the state to make the switch. A little less than half of New Hampshire relies on heating oil, which not only pollutes more than natural gas, but costs a lot more. In the last two winters, for instance, residents spent more than three times heating by oil than gas. But the price of heating oil has plummeted to under $2 a gallon, partly because of domestic productions using technologies similar to those used to extract natural gas, making oil more competitive. Finally, Kinder Morgan has competition. There are other gas pipelines in the works, including two projects by Spectra Energy and one by Portland Natural Gas Transmission Co. Opponents have argued that they be looked at as a whole, and that other changes in the energy market should be examined as well – an increase in the region’s use of wind power, lowering demand via energy efficiency, lowering peak demand via the smart grid, LNG availability and, of course, the effect of various proposals to transport hydroelectric energy from Canada, including Northern Pass, another highly controversial project. But FERC looks at projects one by one and normally dismisses such proposals from opposition groups. But what happens when the opposition includes U.S. Sen. Kelly Ayotte, Gov. Maggie Hassan, Congresswoman Ann Kuster, Congressman Frank Guinta, and even presidential candidates Bernie Sanders and Hilary Clinton? “We know and expect that the NED project will continue to draw close scrutiny,” said Watson in response to Ayotte’s statement against the project. That’s one thing all sides agree on.